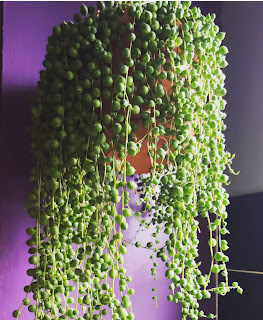 String of Pearls or Senecio rowleyanus if you want to get fancy about it are one of my favourite succulents. They are a fantastic hanging succulent and also look lovely trailing over the edge of a pot in a succulent arrangement. They are an easy to grow houseplant and make an eye catching addition to any home. Once you have the basics covered with String of Pearls they should thrive with minimal care. First thing is the soil, make sure you have it planted up in succulent friendly soil, I shared my soil 'recipe' here. Good drainage is essential to make sure that they aren't sitting in water and prevent rot so make sure what ever way you decide to display it that it has a drainage hole. Like all succulents String of Pearls appreciate bright light, I did find out early on though much to my Pearls detriment, that they burn easily and keeping them out of direct midday sun is a good idea. At the moment I have mine in a North facing window and it has never looked better. Pearls actively grow in Spring/Summer and are dormant in Autumn/Winter, this means that is S/S you water them more frequently, I find that watering once a week during this period works well. Fertiliser is also important during this time, I add it to their water about once every two weeks. In A/W you slow the watering down to once monthly, if you notice the little pearls flattening a little that probably means they could do with a little more. There are two ways you can propagate Pearls. I have to admit that I have never been successful doing it the first way but the second works every time. So although I haven't had success propagating them this way I am assured that it does actually work. It is(supposedly) pretty simple, you cut a string off, strip a few pearls off the end of the cut side and stick it in soil. It sounds easy right? Not for me, they have never actually rooted this way but I would love to know if you have had luck doing it this way? Now for the way that has never let me down! This way is pretty simple too, just like the last time you take a little cutting from your plant then you put it the cut end of the cutting in a glass of water making sure it is submersed and leave the rest of the cutting hanging over the side. Within a week you should see white roots. Then you pot it up! 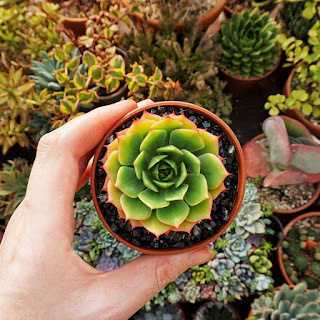 Are you sure water propagation works? Would it be healthy ? As long as the roots are healthy when you plant it. Rot, fungus, etc. comes from the soil, not the water. As the soil deteriorates it can cause all kinds of problems for your plant. 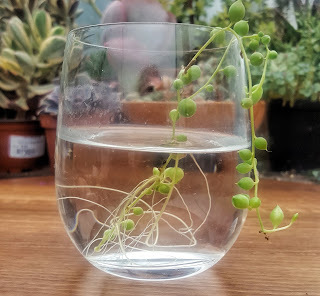 I put string of pearls cuttings in soil and have never had one die. You carefully remove the bottom few leaves (pearls) before planting the cutting in soil or they will rot. I had never thought of rooting them in water like you do. I will have to give that a try! I was successful rooting in soil. I allowed the cut end to callouse first though. Let it sit out a day or two before you plant it. Wait a week, check to see if you have roots. Be patient, it takes a while. Once you have roots you can water it. Don't water until you have roots. Can we grow it in water?? I have been growing one in water since late August when I made made my comment above, it is far smaller than soil grown cuttings of the same age, but looks surprisingly healthy. It is not getting enough sunlight, other than that it looks fine.